The kiva is always the center of the mandala. It is the secret, hidden place where the sipapu meets the sky, the safe place where the past meets the future. The kiva is a place of refuge, a sanctuary from the unpredictability of the elements, a private and safe space combining the practical and spiritual dimensions of existence in one form, a womb of culture and vision, a special opening into the reality of mother. Smaller kivas may have been used like living rooms, the focal point for local clans, a place to stay warm on a winter's day or to keep cool during the summer months while relaxing. The larger kivas provided a place to smoke and discuss community business. At certain times of year, they were used as holy places, accomodating many people visiting from outside the canyon. At these times, there would be chanting, recounting of oral histories, relevant stories and teachings in preparation for rituals. The circle around a central fire pit is a natural mandala, tending to bring the participants into visual contact and intimate communication. 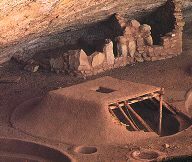 The kiva is an architectural form designed to host the spirit of council fires and gatherings of all kinds which had once taken place outdoors or in caves and natural rockhouses. may have been a suite of domestic rooms. The Great Southern Road, led through the gap in the canyon wall directly to Pueblo Bonito. 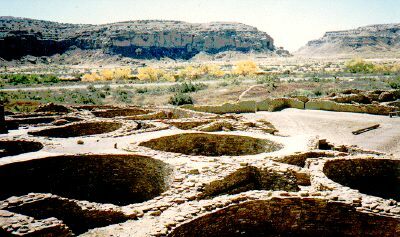 The South Road is one of two major arteries emanating from Chaco Canyon and was likely the major way into the canyon from the southern part of the San Juan Basin. The end of the road is still poorly defined and has been traced as far as Lobo Mesa, an area near Hosta Butte. Four great houses are found along that stretch. The true extent of South Road is estimated to be near 100 miles.Many of the ruins found near the road were built before 1000 AD. 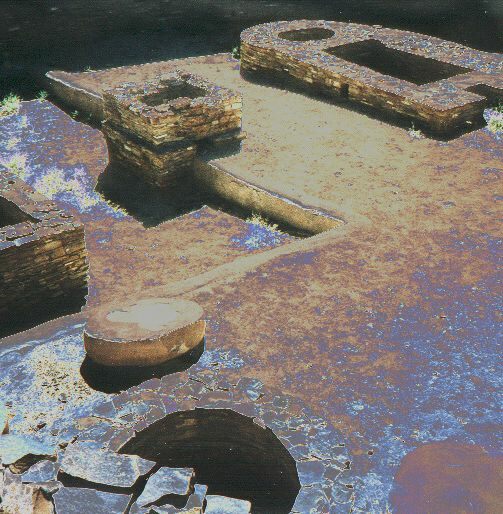 Two of the four masonry-lined pits used for roof support posts; when they were excavated, one of the pits still held a post 26 1/2 " thick, as well as offerings of turquoise chips in leather bags. The large sandstone disk was used as a footing for the post. The square structure is a firebox. Niches in the outer walls held strings of stone and shell beads and were then sealed with masonry.